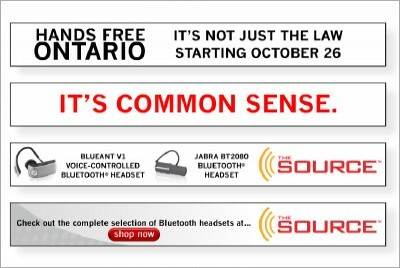 Flash Animated Banners :: INHOUSE Productions Ltd.
INHOUSE was tasked to design and produce a Flash animated banner for The Source, promoting their hands-free Bluetooth devices. The animation featured large headings dropping into place with the main heading in red zooming in from behind and the products slide into place with the final frames of the company’s branding coming into place with the call to action. Design and development by INHOUSE in October 2009.